Have you checked out the new digs? If not... come over and get caught up on Goldies news! 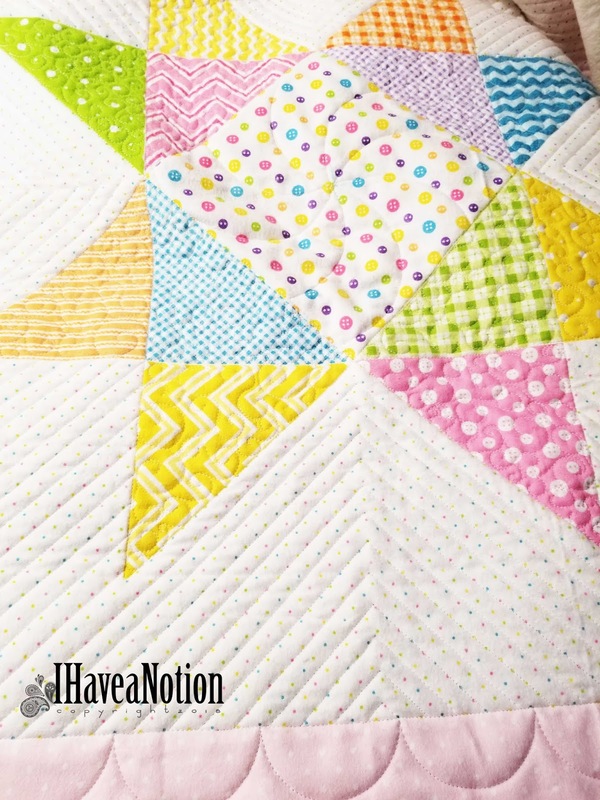 I HAVE A NOTION has new DIGS! Please come have a look! There will be some party favors and prizes… for comments, shares, likes, etc. I would really love your help in spreading the word. but I have had a rather regular view of it… this past year. It all started a year ago when I had a tooth bothering me… would wake me at night and some discomfort during the day. I won’t go into the details, but the tooth still bothers me…. but it will need rest to completely heal… and I am not willing to stop eating, so it is slow going. It is better, certainly! In the meantime, it was suggested that we do some restoration… so fillings are being replaced and another tooth that suffered fractures in a car accident is was crowned. Nerves got very unhappy with that… which has lead to some more detailed procedures. At least one more visit for that! And maybe more if we determine that it is the crown causing the problem. Remember something is Coming 7-31!!! Comeback!!! I did a little playing…. in early May and June. and a delicious commercial poppy print. I created a little free motion thread painting sample for a workshop in early July where I shared my process. I wanted to leave the back visible, so they could see the stitching- thread work that is usually covered by the backing. I teased with this photo on Instagram… A full image when I have it completed. I am in the process of adding the quilting. Of course not much to show… It also requires a little more threadwork on the flowers. Big NEWS coming… Check things out on July 31!…. I have some more giveaways too. Well Ladies.... Not one of you had the correct guess!!! So I think we can rule out fabric! Maybe some day... but not at the moment. There are books! But New books coming!!! Tutorials, possibly.... just have to find a few minutes to do them. Since there were only 4 comments I decided you were all winners. Would Cheryl, Claudia, Jocelyn and Lisa Marie please send me an email with your mailing address! I have a quilt to trim, Yes I spent a few minutes at the longarm. 1st time in months! Yay for me. How about you... been using up some thread? I wonder if they said the same thing about electricity and telephone when they became part of the mainstream of life? In my case it has been mostly the Internet! I think we may finally have it all ironed out. Lucky for me I got the attention of the right person and have had a focused team attempting to get it all ironed out, at least from the pole to the house and the signal in the house!!! I am hoping I never have to revisit this again!!! On the plus side the new computer is a nice addition, the old one still needs to be fixed, but I will have to wait on that.. Until I have 2 days to take it apart and then put it all back together!!! Life aside from the ‘modern woes’ continues. Goldie is doing very well and I think she will get a clean bill of health either at the end of July or in the first week or two of August after her last sample is tested. In the meantime she will be under going a ‘Girlectomy’ 7/31. She will be rendered unable to reproduce after! As I have been saying (over and over again)… I have been working hard behind the scenes at IHAN and changes will become apparent soon. So many little things to get lined up and the difficulties with the Internet did not make it any easier. But check back soon… lots of surprises, games and giveaways coming!!! We’re going to have some fun and games in the meantime. Are you on Facebook or Instagram? Find and like “I Have a Notion” for future… games. For now its a guessing game what do you think is coming? Leave a comment with your guess below. Three winners from the comments on this blog post. Winners announced on Monday evening. I can hear Meatloaf in the background shouting that line from 'Paradise by the Dashboard Lights’. A totally different meaning as to why though. We have been under some heat stress in Kentucky!!! Along with a hu ge chunk of the USA! STOP!! was what the outside part of the indoor/outdoor thermometer decided to say… the inside part was content though. I bought it when we moved to Chicago for $10 bucks in 2007. It has since lived in South Africa, Virginia and Kentucky!Pretty well traveled thermometer. I will miss it! Since it has been up highest temp it has recorded was 102, with a heat index of111. We’ve had exactly 1 thunderstorm since we put it up…. so the rainfall has not been significant really about 1/2 the amount showing, because I had to spend a day calibrating the little dump bucked…. a pain for sure. Another places I would like to shout STOP is with the Internet!!! Between the website melt down again…. with a bandwidth cap reached. Nothing to do about that but wait. The Clearance Sale had something to do with it,I think. There are still have some things that need to go, so if you are looking for thread, machine embroidery designs or stabilizer… there is still plenty!!! EVERYTHING is at least 50% off! This is not a heat map, but a map of an Internet outage. I am working on a solution and it is taking way more time than I anticipated! So far 3 dedicated months of all my creative and otherwise unallocated time. Who knew that road block after road block would pop up. Most of them seem to have been technology related. Internet Service issues… outages, followed by Provider Equipment failures and then yep my computer failed. Nothing serious, just a power button that refuses to work. So days of a project that were not saved to the NAS (network area storage) device are stuck in that computer!!! So I have to back track… for the 3rd time! I am not complaining… just disappointed that I do not get as much of anything done as I have on my imaginary timeline. I was hoping to be moving forward long before now! Of course bringing a new computer up to speed takes a serious chunk of time too. I will try to not be so quiet and share more…. but I was really hoping to fill up all this quiet blank space with excitement and FUN!!! Please Stay tuned. There really is LOTS more coming! And do check out the store, Ihaveanotion.com the Clearance continues! As things go… this is the worst… and not something I was aware of. But is seems IHaveaNotion.com has a bandwidth cap and the Blowout Sale has exceeded the allotment! Good news is your are visiting the shop. Bad news is …. no one can visit the shop. But you can call me or email. Its the long way around… but doable for the short term. I’m working on it so please be patient… Please Please Please be patient. still lots of stock to clear out. Too MUCH! Everything in the store at www.ihaveanotion.com is 50% off. EVERY SINGLE THING in the STORE!!! Order before noon EST and it will go out the same day…. most days! It seems blogger is making some changes… comments are not being emailed, (a Google bug or related to the GDPR thing don’t know), Open ID is going away, as well as some other things changing). Some days I hate change!!! Do you find yourself starting a project and then you find yourself… doing something related or along the way… and that leads to another and another, and another… and pretty soon several hours have passed and you have not yet finished the first task? I have finally finished or disentangled myself from several large projects and obligations. Yesterday and today were almost totally ready for my own stuff. But as I mentioned above… not so fast. Today I had planned to put up a blog post, but you know what today is? May 25th, the deadline for the GDPR to take effect. While I know what it was and that for anyone reading from the EU would need to be notified about any data collection done on the blog and the store and what you do with it. Truth is I don’t collect anything. I can hardly keep track of me and my stuff I don’t need the added responsibility of someone elses stuff too. We should all be concerned with where our information is and how it is being used by sites we visit, especially with the inability to control cookies, all the website data breaches/thefts and the demise of “Net Neutrality” (if you feel inclined let your legislators know that we want Net Neutrality back, but that is another rabbit hole. So… while I had visions of getting things accomplished today… it took just about all day to get here! What did you do today? Do you care about Privacy Policies, GDPR or Net Neutrality? Goldie is 9 months old now and almost that size. Her early difficulties… kind of held her back a little. Since we started down this path to getting her colon cleared she has gained lots of weight and grown to almost the correct size. I took another sample up to the specialists… for testing in late April. For some reason it took more than a week to get the results…. (their tests result timeline is all over the map). I was hoping to say that we got the all clear and on to a normal dog life for her. Nope, she is still positive for Cryptosporidium. Doc doesn’t like it, but doesn’t see any reason to do more invasive tests. I’m happy, my wallet is happy and I’m sure Goldie would be happy too, if she knew what we were discussing. Vet has suggested that we continue with the antibiotic powder for 4-5 months and then retest. Not a difficult issue, except that she has to be dosed with a meal every 8 hours! So no late nights or sleeping in… for at least one of us! This schedule also means no opportunities for both of us (humans) to be away together yet. We got as far as making plans and kennel reservations, and then the idea of counting on others to medicate her on time, scared us ….into…. one of us staying home. Goldie and Linzi playing…. as you can see Goldie has done some growing… almost as tall as Linzi… and can easily out run her, but that might be more youth than growth! ‘Floriani Product’ …. in the wild! The maker calls it a Butterfly Bowl. I couldn’t imagine what it looked like from the name… but she also sent a picture. Just beautiful! Lina took advantage of the ‘Clearance Sale’ and snapped up a bunch of the Floriani Variegated thread and sent the picture with permission to share. The butterfly (Luna Moth) is Machine Embroidered, using the same thread top and bobbin so the back side is just as pretty as the top. Still lots of Floriani in the shop…. and the price can’t be beat! HALF off! Nope…. 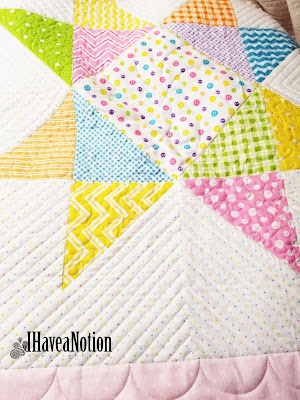 there are still plenty of items on Clearance at I Have a Notion! Have I mentioned thread? Floriani Thread in particular. If you machine embroider, this is a deal. $2.99 per mini cone. 1100 yards shiny polyester thread. At this price you can certainly fill in some of those missing colors or enhance your color library. I don’t think there is a better price for this thread anywhere else! You don’t embroider? Do you know someone that does? Send them a link! and thanks for passing it on. On another note… I have another house guest. This one is of a different variety though. Just about every where I have lived… I have had a resident pair of doves. When we moved into this house, we had a pair that had a nest on a drain spout under the eaves. A hawk got the female… and that was that. While we have had as many as 14 doves around the feeder at one time, none had taken up a nest where I could see them. This year is different. This fellow (males sit the nest during the day, females at night) is about 3 feet away from the front door. In about 2 weeks there should be some hungry little mouths… up there. EVERYTHING in the store 50% off!!! (Great for machine embroidery, longarm quilting or thread painting/sketching). Don't wait some colors are getting low! and a few are gone! I am a recent finder of the Floriani thread, and I have been playing with it on the longarm. I think it is a finer thread than Glide, which is a 40 weight thread, so it does not show quite as much, something I like. And by not showing quite as much the sheen is a little less as well, again something I like. One of the other things of note is that Glide likes to untwist while traveling from the spool/cone to the needle, on my longarm, as I hear, also on many other longarms as well. The Floriani does not seem to do that! Everything in the I Have a Notion store (www.ihaveanotion.com) is on sale. CHECK it out, there just might be something you need or want or…. As usual… I have been busy and behind as far as keeping things caught up or current. Part of my problem is that I don’t think much of what I do is interesting… or even worth mentioning until after the fact!!! Sometimes well after the fact! Does that happen to you too? Sometimes I see my obligations as just that -a job to accomplish… and don’t stop long enough to see that there is value in just doing the job. For instance. 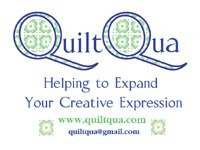 One of the guilds in town will be hosting a Quilt Auction as a fund raiser that will feature both a Silent Auction and a Live Auction as well as a rummage table we are calling the ‘Quilters Attic’. While my hand was resting in February I built a web page for the guild… nothing spectacular in terms of design, as it was to show some of the quilts to be auctioned. If you are interested in visiting that page…. go here: Nine Patchers Quilt Auction and of course if you are nearby… please come. Next up was taking pictures of those quilts. It was the photographing, that I think I missed a great opportunity to talk about. Over the years there has been lots of information shared about how to photograph quilts… so I took much of what I remember reading… about the subject… using a tripod, appropriate lighting, level camera and quilt display and distance as well as focal length. I am a nature photographer… and generally don’t have the patience for lighting a subject with artificial light. The shooting quilts went really well, even though all of them were photographed indoors! and without a neutral wall behind them at one location and pretty closed to the ceiling… several had to be pinned to a sheet. Our weather in Kentucky hasn’t cooperated with warm enough days…. to shoot outside, and not bright enough to use south facing windows for a nice natural light indoors… So I had to also play with fluorescent and fill flash. Overall I think the quilts look good. Next I was asked to photograph a knife. That proved to be a different lighting difficulty. For this I actually wanted the dull dark grey skies!!! Metal reflects light and creates bright reflections that look like imperfections in the metal work. We decided that a new lens would help with that problem… so another small obstacle … to over come. Well after a couple of weeks of experimentation… I think I finally nailed it. Have I been doing anything remotely related to fiber recently…NO!!! I’ll have to explain more later… What about you…. are you keeping up? Some Cheese Please! and Flamingos!!! Some days I feel like all I do is “whine” about time and where has it gone? And this week doesn’t feel any different! There must me something I no longer do … as well as I used to, or is it that things take longer now than they did before? Or have I just gotten lazy? But I sure wish I could figure it out! So Kelly sent me these on Sunday…. a little late to posting… but they make me smile. I wish I had a neighbor like this!! !